Under the watchful eye of her overprotective mother, Eve grew up in a world without magic and fancy. She never cared about riding a unicorn, dancing at balls or being a princess. Now, all the things she never desired are hers and every other girl's dream is her nightmare"
The story started with a flock of water birds attacking my car, strangely enough. I have always loved to write and when I was younger, I wrote poetry and short stories. I put those things away when I became a mom and went to college. One day, I just decided that I wanted to write a novel. I had something to prove to myself and I have accomplished that six times over. The best part is definitely the creative output. Just being able to express everything in words is a gift for a person’s soul. The worst part is the numbers and reviews. Constantly checking to see if someone has bought your book or left a review will drive you crazy. I have no schedule. I write whenever and wherever. I am lucky enough to be taking a year off from working outside the home in order to work at free will but secretly, the day job rarely kept me from writing day and night. From life, dreams, my children, my fears. Everything around me is an inspiration. Have a tough skin. Someone somewhere is not going to like your work. You will be told no by agents and publishers. You will get bad reviews. You will have people tell you what you should have done. Take what you can from those. Always make everything a learning experience. The hurt will come but then again, so will the rewards. No. I have been lucky to work with a great bunch of publishers who pretty much give me my way on most things. All of them! Isn't that the ultimate dream? Even though Hollywood always butchers the novels, it would just be an amazing thing. I often dream of my characters. Tritchichiq has appeared often and so has Baku of the Bakezori. I don’t know that my readers can be surprised. My dear bunch of Freaks, Geeks, and Ducky Dears are way too worldly for all that. I spot edit as I go, but there is never a solid plan. The words just pour out and sometimes they characters let me in on the fact that there will be more to come. Sometimes, it is all a surprise. For my short stories, yes. I find that my shorts are often very dark and I want opinions to ensure I don’t cross to many lines. On my full length novels, I do not use betas. They are just special to me. Stolen, Faire Eve, and my short stories were all very fun. The energy and thrill of new worlds and new characters has wonderful connotations. The final book in the Requiem series was the most difficult. I grew weary of tormenting my characters but I was putting off saying goodbye to my first series. When I finally accepted that they would live on as new readers discovered their world, I wrote it without hesitation or the grim sadness that had settled over me. 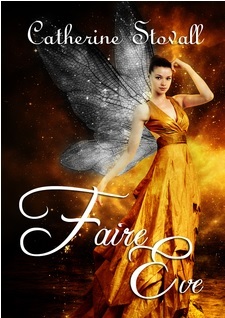 After the release of Faire Eve from Crushing Hearts and Black Butterfly Publishing, I am looking forward to many new adventures. Eternity: Requiem of Humanity: Book 3 will be releasing from Untreed Reads later this year. I am also awaiting the release of my short story Bloody Freedom from Vamptasy Publishing in August. I have several other short stories and two full lengths completed and awaiting the final contracts. No one spoke and Eldon seemed hyper-alert. The sound came as a low rumble, as if somewhere in the distance, a train hurtled towards them on worn tracks. Quickly, it grew louder and the temperature dropped in a sudden plunge. As peril filled the air around them, the Ki’Lin broke into a run. Faster than the wind itself, they plummeted toward the boulders. Eve screamed with the sudden burst of speed. She locked her legs tight to Bai’s sides and gripped his mane fiercely to try to stay abreast. The stallion made no protest but Eve felt guilty about her own brutality but not guilty enough to slacken her hold and risk taking a fall. Eve focused on the boulders, hoping they reached whatever safe haven lay within them. She did not know if it was merely a safe place or another gate, but she knew they must make it in order to escape the darkness. Eve leaned low over Bai’s strong neck. Her face nearly touched her hands as she fought to keep herself out of the chilling wind. She turned her head to the side to prevent his mane from assaulting her eyes and nose. Eldon sat high on Heian’s back with his silver blade drawn. His hair blew back in the wind and his face wore a mask of bravery. Eve felt safer knowing he would defend her. He was a Daione Warrior, and his duty was to the queen. Eve tensed. She knew they must be nearing their destination but the roaring drowned out the sound of the unicorns. She couldn’t help wanting to rise up and witness what happened when they crossed the spot in the road. Even as frightened as she was, she expected it to be nothing more than miraculous. As she started to rise, she saw the eyes. To the right of the road, a forest stood. It did not seem special, an area full of tall trees. Deep within the darkest shadows, Eve saw two glowing blue eyes, much bigger than any animal in her world. When she looked into them, it felt as if a hand of ice reached in and covered her heart. She trembled violently and when she opened her mouth to scream, her voice froze in her chest. Almost at the same moment, the group slammed through the passage. A dizzying and blinding change instantly overcame her. Eve, Bai, Eldon, and Heian were the first ones through. The passage led them from an empty countryside into the heart of a bustling village. Anyone who traveled the way often would know to do so slowly but the group had no choice but to charge through at full speed in order to escape the demon in the woods. Bai and Heian reared up, front hooves filleting the sky above the cowering pedestrians. Those who were lucky enough to be safely out of harm’s way seemed too stunned by the presence of Ki’Lin to be afraid for their fellow townspeople. Some shouted angry screams, while others emitted gasps of awe. The rest of Eve’s escorts barreled through the gate and skidded to a halt but not soon enough to keep from colliding painfully with each other. Eve’s grip faltered and she fell. No strong arms were there to catch her. She and Eldon were separated during the chaos. She slammed down hard onto the cobblestone street and cried out in pain. Stamping hooves pounded all around her and she choked on the cloud of dust they brought with them through the pass. Curling herself in a protective ball and covering her head with her hands, Eve screamed for Eldon.